Gluten is a protein composite found in “grass related” grains, and is made up of two proteins called prolamins and glutelins. These proteins exist in all grains and confusingly enough they’re all called “gluten”. However, as of what we know today, only the prolamins in wheat (gliadin), barley (hordein), and rye (secalin) are harmful to those with coeliacs disease, DH or non-coeliac gluten intolerance. Some research also suggests that the prolamins in oats (called avenin) can be a source for concern. The Celiac Sprue Association reports that avenin, in fact contains some of the amino acid sequences found in gluten that triggers an auto-immune response, though in much lower quantities. Different authorities have taken different stands on this topic, and as a result you may find “certified gluten free” oats (free of cross-contamination) in countries such as USA, UK and throughout Scandinavia. In Australia and New Zealand however it has been decided that oats are not to be considered gluten free. It is important to note that if you wish to purchase “gluten free” oats, you must make sure it is labelled as such. This is because oats is frequently cross-contaminated during handling and production. An example is how crops are regularly moved around to keep the soil fertile, resulting in the odd stray becoming mixed up in the batch. Gluten is the “glue” that holds bread, pasta and cake together. It gives elasticity, a chewy texture and it helps food keep its shape. When the yeast in baked goods releases gasses, gluten creates the elastic net that “traps” them, and allows the dough to rise. Because of its desired qualities gluten is often also added to baked goods to make them look and taste even “greater”. Gluten is widely used as additives in other food items, as well as in cosmetics, conditioners and medication. Gluten naturally occurs in grains, and the harmful versions are found in wheat, barley and rye (and possibly oats). Gluten can be added to foods, either in an obvious or in a “hidden” manner. The easy ones to detect are the likes of “wheat starch”, “barley malt” or “wheat bran”. They are simple enough to understand because they contain the names of the grains we know to avoid. Then there’s the seemingly innocent ingredients like “caramel colouring” and “baking powder”, that may surprise you. The confusion starts when words like “Dextrines”, “Emulsifiers” and “Amp-Isostearoyl Hydrolyzed” turn up on the labelling.. It is impossible to learn every word you might ever come across on a label. You can, however, find a list of items that are unsafe for a coeliac on this link, which you may print out and keep in your wallet. WHICH FOODS DEFINITELY DON’T CONTAIN GLUTEN? Many, many foods, in fact, most foods (which you will soon discover) don’t contain any gluten and are perfectly safe! It takes a while to learn what’s what, and I feel like I can eat a million more food items now than when I was first diagnosed. Naturally it was always the same, but I know more now and the world “opens up” as I learn. Naturally gluten free is always the best way to go. A good place to start is vegetables and fruits, unprocessed meats, seafood and poultry, as well as carbs like potatoes, corn and rice. As a rule, if it hasn’t been spiced, mixed or blended, you can eat it. Always wash or peel as some items may at some point have touched gluten-containing foods. Better safe than sorry. There are many “specialty” grains and flours that are naturally gluten-free, such as buckwheat (which isn’t a wheat at all! ), tapioca, amaranth, arrowroot, millet, quinoa, sorghum, gram flour, almond flour and soy flour. The list goes on and on, and learning to use these “new” grains can be a lot of fun. WHAT ARE THE RULES FOR GLUTEN-FREE LABELLING? Rules about gluten labeling differ from country to country,and it is important that you familiarise yourself with what applies to you. In Europe and the US, food containing up to 20 parts per millionof gluten may be labeled gluten free. In Australia and New Zealand, food labeled gluten-free cannot contain any detectable gluten or oats. In addition, AUS and NZ have a bracket for “low gluten” which allows for up to 200 ppm of gluten. Be aware of the “low gluten” foods as they are not suitable for coeliacs. Parts Per Million (ppm) explains the quantity of gluten allowed. 1 ppm equals 1mg per liter or 1 mg per kg. This means that food containing 20ppm of gluten has 0,002% gluten content. Naturally, if you eat large amounts of foods containing “very little gluten”, eventually it will add up and you are in fact eating gluten. Some products are debatable in this context. One of them is glucose syrup made from wheat. In Europe this is considered to be safe for coeliacs, yet down-under it is not. More on the discussion on differences in gluten labeling here. So there’s a fad going on. Apparently Victoria Beckham and Gwyneth Paltrow are on a “gluten free diet” now. The good thing about the rising trendiness of “going gluten-free” are the heaping shelves in the health food section. The not-so-great side effects are the misconceptions of the severity of coeliac disease, the waiters who get sick of “hearing about it”, and the possibility it might “blow over” like so many fads before it. I was recently at a dinner party with people who didn’t know me, and thus hadn’t prepared anything I could safely eat. As I helped myself to nothing but steamed vegetables, a fellow guest naturally asked why. No sooner had I uttered the word “gluten”, than had he rolled his eyes back and loudly exclaimed his frustration with the “so-called gluten allergies” everyone suddenly seems to have attracted. It’s awkward enough to have to be the odd one out at social gatherings which include food (as they all do), not to have to endure public ridicule by loud-mouthed besserw issers with verbal diarrhea as well. 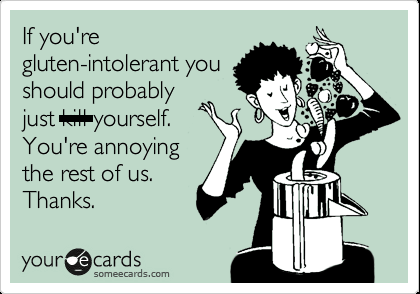 My favoured tactic is to retaliate with an equally public exposure of their ignorance. It seems to do the trick, although it really shouldn’t be necessary. 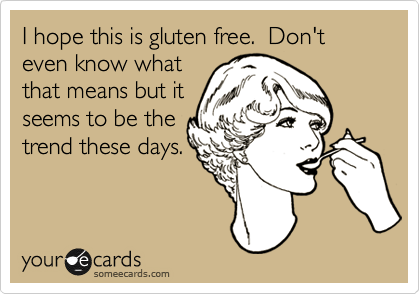 I can see how it could be perceived as funny.. for someone who does not have a gluten related condition. That being said, if you do not have a gluten related condition the benefits of a gluten free diet are highly subjective, and this is a much debated topic. Some may find that cutting (or reducing) gluten has a positive effect on aspects of their health, however radically changing your diet without consulting a health care professional may lead to deficiencies. The ones who need to cut gluten out of their diet however are those diagnosed with either coeliacs disease, non-coeliac gluten sensitivity, gluten intolerance, gluten entereopathy, Dermatitis Herpetiformis or celiac sprue. Some of these diagnosis overlap, but all wordings apply. I thought that description was quite novel and really rather smart! And it holds a lot of truth; our digestive system, from start to bottom, is created to absorb into the body what it needs.